I heard through the fog when my mate told me that Emily was putting a tube in to feed me nutrients through. I thanked the ancestors for sending us help, but also prayed for us to make it long enough for the nutrients to work. I was really trying to stay calm, but I felt trapped in this fog. It was almost suffocating at times… usually when I felt the most stressed or scared. I was able to hold on easier when I could hear Sam talking to us, but it had been quiet for a little while now. When the drums started back up the next time, it was different... more powerful somehow... and there was an echo. The faint drums and song started, then another set started that sounded and felt much closer. I could smell something earthy in the air -incense- then a close voice began to chant something, weaving words through the song in Quileute. After several minutes, I began to notice the faint drums and song becoming louder, plus I could just start to make out shapes in the fog. I heard my Sam’s voice mix in with the closer song, so I knew he must be singing with the elders as Quil prayed over me to the ancestors. As the shapes got clearer through the fog, I could see wolves like Sam and Paul taking up a protective circle around me. There must have been close to 20 of them with all different markings and colors of fur. I gave them a genuine smile, knowing they would never hurt me. I placed my hand on my lower stomach, to make my point. The great wolf got down on his belly, then nudged my stomach with his nose. I spoke softly, somehow knowing what he wanted, "They are My Sam’s. The first active wolf babies for two generations, as well as the alpha’s first children. The ancestral magic made them implant a lot sooner, even though Sam imprinted on me only days ago. Was it you who gifted us so?" The great wolf sat back on his hind legs, nodding as he looked around at all the other wolves. I gasped softly, "You gifted some of the magic that remains in all of you to me? But… I’m not Quileute. I’m nothing special." The wolf shook his head, then there was a blinding shimmer as he transformed into his human form, wearing a tribal headdress and clothing befitting a chief of his tribe. I bowed my head again, just before Taha Aki placed both of his hands on my shoulders. He spoke with a thick accent, "You are special. We set the conditions for the magic to be gifted, but we did not decide who. The elements decided that. Earth, air, fire, water, and spirit. If the elements did not deem you worthy, you would not have been created and gifted with such power, Isabella. It is what called us to you when you first became in danger. It will always call us to you in times of need, though not always in this setting or form. We could not make our presence known for the first time until Quil Ateara began the prayer, though." Taha Aki said something in Quileute, then a soft round pallet of bedding appeared on the ground several feet from our location. He motioned to it, saying encouragingly, "You must lay on it now, so that the medicine men and I can work the prayer in unison with your chief, your elders, and your alpha mate. 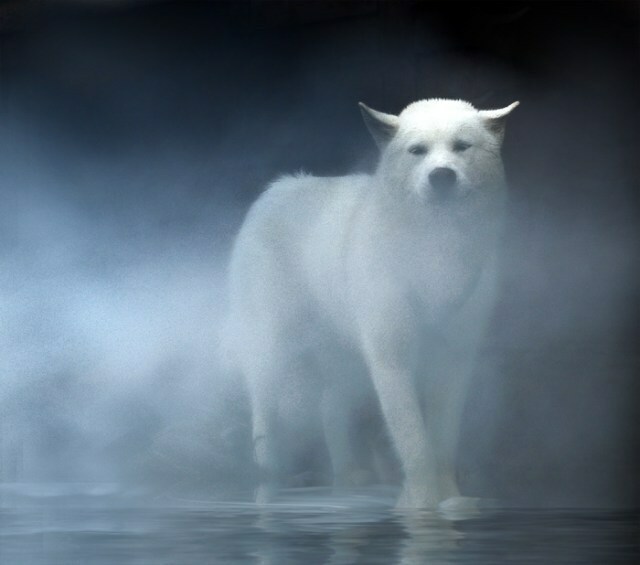 You will be safe with the wolves standing for you, plus you will be given some of the energy from each element. Be not afraid of it, as it will only make itself known to protect you and your loved ones in dire need. It, along with the magic of the ancestors that resides in you, will help guide us to you when you are in need." I nodded, but asked as he led me to the pallet, "How do I thank the elements for their continued gifts?” He laughed, then reverently touched my stomach, "Taste and savor the water you drink… or that flows over and around your body. Be merry around the flames of a bonfire, or acknowledge the flame that cooks your food. Plant and grow things in the rich earth, then see the beauty it brings to life. Dance in the breeze whenever the feeling strikes you, or sing beautiful songs to your precious little ones… and always be true to yourself, Isabella.” He smiled as he reverently touched my stomach again. “Live life to its fullest, guide your young in the ways of our tribe, and teach them responsibly of the magic that resides in them. You have a strong spirit, which will guide many. Never forget your instincts. They will be your guide, and the elements will help you along the way." I nodded, "Thank you for your guidance. May I speak of this when I return to My Sam?" He nodded with a bright smile, "Your Sam has felt you this entire time, as have the elders, once they began the ritual... but to a lesser extent. You may speak of this within your circle of trusted." I nodded, “May I ask you one more thing?” He chuckled with a grin, so I asked, “Were you ever rejoined with your imprints after you passed?” He beamed at me, "Yes, Young One. We are all with our hearts. Unfortunately, no matter how they wished to be here for you now, they can not make themselves known in this form as we can. My heart did come to me before I showed my form to you, to tell me that they are trying to find a way to help guide you through your current and future pregnancies." I smiled, "I thank them for wanting to, and am very glad they are with you. Thank you all." I looked around the clearing at my last words. Every wolf bowed its large head to me in turn. I sat on the soft pallet of bedding, then layed on my back so that they could begin. "Close your eyes, Isabella. Close them, and let everything go. Float with the song. It will lead you back to your Sam at the right time." I nodded as I closed my eyes, then somehow the words of the song weren’t echoed any longer. They were all singing in unison… in here with me, as well as out there with Sam. I let the song take over. Slowly, so slowly, I felt my energy building. At first it was such small increments, that it felt like they would slip right past me. Then I remembered to let everything go, and the song seemed to guide me to the energy. If I tried to reach for it, it would slip away, but If I let it come to me, my energy level seemed to increase. That’s when I figured out that I was expending the energy trying to reach for it. I lost track of time and everything else. I heard Taha Aki and Sam louder than the others, just floating along with the song as the tune wove a melody through me. When the Quileute drums and song ended, it was silent for a bit, then I heard My Sam singing the most beautiful and sweet song. I didn’t know what it was, but I felt it guiding me back to him. My Isabella. I could feel her now in the deep sleep she was in. There was no energy, but there was so much awe, respect, and understanding. I knew something magnificent was being shown to her. It didn’t start until a bit after the ritual began, but I was hoping that the ancestors had shown my Isabella and little miracles the way to get back to me. Emily came in after a while, silently sliding the valve almost all the way open on Isabella’s IV. Since the bag was only a part of the way gone when she came in, I was surprised to see her getting another bag of fluids ready in less than 2 hours. The syringes looked fuller this time, too, which meant that my Angel truly had been running on zero for too long. This went on the same way for the next twelve hours, with Emily changing the IV bags every three hours, as well as continuing with the higher dosages of nutrients. I could feel Isabella gaining strength, so I knew that the ritual and fluids were working. I whispered in her ear, "That’s it, My Angel. Keep gaining strength. Gain all of it you can, Isabella. Come back to me. Keep our little ones safe, and the three of you come back to me." At the twelve-hour mark, the ritual came to a close. Quil said tiredly, “It is done.” I nodded, "You must eat and rest. There are two open rooms up here you can use unless you prefer to go home." They nodded, then Billy said, "We’re in no condition to leave, Sam, nor would we want to… not until we knew Bella was awake and stable. We’ll stay until then." I called out to Paul in a normal voice, "Paul, make sure the girls have food and drinks ready for the elders. The ritual is done, and they need sustenance. Then I need you to come and help Billy. Jared, go over to the house to get the two queen beds and the linens. Leave the head and foot boards. Set them up in the theater room. You, Kim, Paul, and Leah can use the theater room to sleep in if you want to." I looked at Sue then, “What would you like me to do for Seth?” She shook her head tiredly, "He’s going to be staying with Jacob at Billy’s. It’s already taken care of. You just concentrate on Bella, Dear." I nodded, then Kim brought up a tray of food, saying softly, “I know you probably aren’t hungry, Sam… but you need to eat, too.” I shook my head, only to hear Emily scold, “You won’t do Bella any good when she wakes if you don’t have the energy you need to care for her.” I took the tray, saying in a pained whisper, "You’re right, I know. It’s just so hard to think about eating when she’s lying here like this." They agreed, but Sue said, "She’ll need you to be strong, Dear. Eat, then rest a while with her. She’ll be awake soon, I’m sure of it." They all left the room as I started eating slowly from the tray. When I couldn’t bear to eat any more, I curled as close to Isabella as I could. I placed my hand on her stomach, then suddenly had the urge to sing the lullaby my Mama sang to me when I was little. It was in Quileute, and I remembered every word. I started singing softly, continuing as I remembered every moment of our time together... of how much she meant to me. As soon I started to drift off, I realised Mama had shown up, and was stroking my tear-stained cheek. I went to say something, but she shook her head, "Just sleep, My Son. Help her find her way back to you. I’ll be here when you wake." I nodded as I curled back into my Angel, then Mama started singing the lullaby I had just stopped, her hand entwined with mine on Isabella's stomach. Soon I drifted off into a dreamless sleep. A beautiful female voice took over singing the song when Sam’s stopped, but I could still feel him with me. I felt more and more energy flow into me, bit by bit, as the beautiful voice guided me back to My Sam. When my breath hitched slightly and I opened my eyes, the beautiful voice whispered, "Don’t move, Little One, or you’ll pull at your tubing. I’ll come to you." I managed a slight nod. The face that went with the voice looked extremely similar to Sam’s, though infinitely more feminine. I furrowed my eyebrows, "Mrs. Uley?" She chuckled in response, "Eva, Dear. Would you like me to get Emily for you?" I nodded, saying hoarsely, "Please. Will I be able to speak to you again? I’m very sorry to have to meet you this way. Sam was excited for me to meet you properly." She beamed at me, “I promised him I’d be here when he woke, so I hope we will, Bella.” She ducked out of the room quietly, which gave me a chance to take stock of myself. Okay, IV in my arm and catheter for bladder relief, but Sam was next to me. I turned my head while stroking his hand, which rested on my stomach. I didn’t know how long I was out, or how long he had slept, but I needed to see his eyes. I whispered, "Sam… My Sam… I love you, and I need to see you. Please.” I stroked his hand again, then felt him stir. His eyes fluttered open, meeting mine. Suddenly they filled with tears as he clutched me gently, sobbing, "I was so afraid… so scared the three of you wouldn’t come back to me. Oh, My Angel, tell me I’m not dreaming. Tell me you’re really awake." I chuckled, lifted his face to mine, then wiped the fallen tears from his face as I smiled, "I’m really awake, and so are you. We have so much to thank the ancestors for, Sam. I need to tell all of you, but I really want to get this catheter out of me so I can use the bathroom like a human." Emily laughed, "That’s what I’m here for… along with checking you over, of course. It’s nice to see you awake again; you gave us all quite the scare. How are you?" I smiled as she sat next to me on the bed, “Well, other than the irritating catheter in my bladder, I haven’t really had time to do much except for notice that I’m not in a hospital, then let Sam know neither of us are asleep.” She nodded, "Well, I’ll need to draw blood and check your levels, so don’t expect the IV to go anywhere for a while. Once I remove the irritating tubing, you can be carried to the bathroom and back to bed, but that’s it for you until we know what we’re dealing with as far as nutrient levels. With the starting point blood work, I’ll be able to calculate how much you need in a day." I nodded, "Thanks, Emily. How long have I been asleep?" Sam whispered, “Just over 24 hours.” My eyes went wide, then I looked at Eva standing by the door, "You sang. After Sam sang that beautiful song a few times, you sang it… but you didn’t stop. How long were you singing for us?" She smiled bashfully, "Almost 9 hours, Bella. Sam was singing the lullaby when I arrived, but he was almost asleep. I figured it must be something that was helping to bring you back to him, so I would sing it in his stead until he could take over again." I nodded, "It was guiding me back home… to My Sam. It was like I was floating on the melody of the song. It was taking me to where I needed to be to wake up." Sam smiled at his mom, “Thank you, Mama.” Eva nodded, and whispered, "Anything to see you happy, Sam. I’ll step out to let Emily do what she needs to, and I’ll see what the girls have fixed. Emily, is there something special you want for Bella?" Emily looked at me, so I immediately begged, "My appetite is through the roof. Please, please don’t make me eat something small or bland right now. I’m begging you, Doc. I’m way past the ‘Feed me, Seymour’ stage. We’re practically crying inside for tasty mounds of food." Sam chuckled, then Emily laughed, “We’ll see how you do, but if you throw it up, I’m taking you straight to Blandville.” I scrunched up my nose as Eva said, "Alright, then. Tasty mounds of food coming up." She closed the door behind her, then Emily said, "Alright, Bella. Relax for me, take a deep breath, then let it out slowly when I say ‘now’." I nodded, took a deep breath, then when she gave the signal, I let it out long and slow. The removal was done, and after washing her hands and changing gloves, she brought over a small kit with sterile supplies to the other side of the bed. "Sam, I need to draw her blood now. Come sit in the chair, please." He beamed at me, then Quil gasped from the doorway, “I’ve not heard an imprint refer to her wolf like that since my Grandpa, Isabella.” He looked at me in awe as I smiled knowingly. "Hi, Quil. Can I ask what color your Grandpa was?" His eyes went a little wide, but he said, “He was a deep silver, with a charcoal-tipped muzzle and ears, along with a white head and underbelly.” I nodded, trying to stay aloof, "I was just telling Sam that I heard him from the other place. I heard you, Sue, and Billy, too. I have a lot to tell all of you, but I need tons of food first, and some serious milkshake action." Quil smiled, "Well, I’ll leave you to it. I’m very glad you’re awake, Bella. You had us all severely worried." I nodded, "I was worried for a while, too, Quil. It’s part of the story, though." Charlie immediately took the vacant seat, and I smiled, "Umm, Daddy? I know you want to see me, but I’m really so frickin' hungry. Can you let Sam sit me up before you sit there, please? All my tubes and hook-ups are on my other side." Sam chuckled and Charlie blushed, "Sorry, Princess. I’m just so happy you’re finally awake. You scared the bujesus out of me." I nodded when he stood up so Sam could come to me. While Sam carefully moved me, I said, "It didn’t register to me until I was already asleep, Dad. I had gotten used to the energy level I had after the night Sam saved me, so I didn’t realise I was so low."